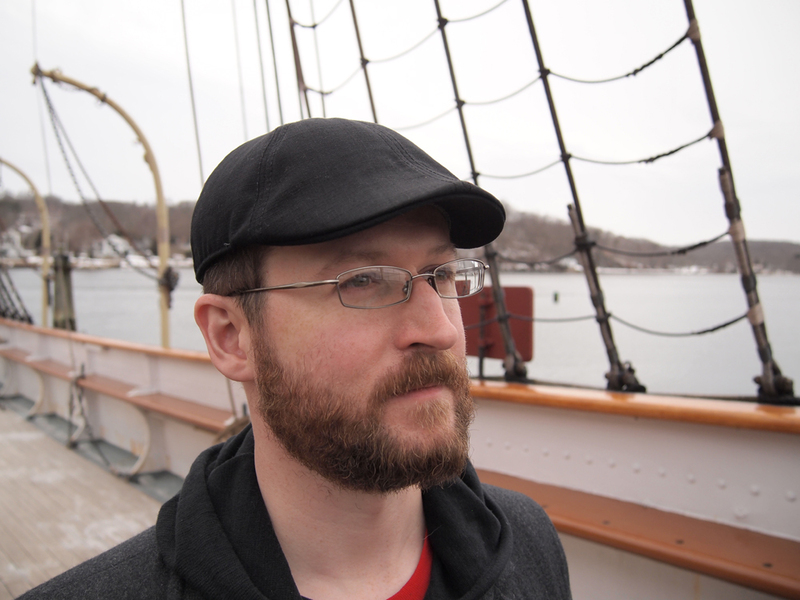 MICHAEL A. VENTRELLA: I am pleased to be interviewing Robert Brockway today. Robert Brockway is a Senior Editor and columnist for Cracked.com. 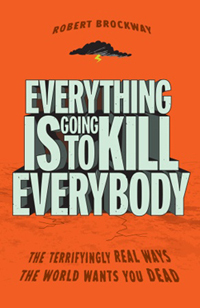 He is the author of two books, the cyberpunk novel RX: A TALE OF ELECTRONEGATIVITY, and the comedic non-fiction essay collection EVERYTHING IS GOING TO KILL EVERYBODY: THE TERRIYINGLY REAL WAYS THE WORLD WANTS YOU DEAD. He lives in Portland, Oregon, with his wife Meagan and their two dogs, Detectives Martin Riggs and Roger Murtaugh. He has been known, on occasion, to have a beard. Tell us about your novel RX: A TALE OF ELECTRONEGATIVITY! ROBERT BROCKWAY: RX is a cyberpunk novel about Red, a bio-hacker, chemical beta tester and specialty drug dealer in a futuristic mega-scraper city called the Four Posts. Pharmaceuticals aren’t just tolerated in the Four Posts, they’re practically a necessity. Everybody medicates constantly, to the point that Rx Feeds – nano-assembling custom drug stations – are piped into every household. The hot new drug of choice is Presence, a powerful hallucinogenic gas that simulates time travel, but with none of the consequences. Want to shoot a T. Rex? Fist fight King Henry II? Bring a battle-mech to the Civil War? Dose up on Presence and go for it. Your timeline won’t change in the slightest. Red’s best paying side-job is beta-testing new strains of Presence – hey, somebody has to go back and make sure the dose is taking customers to the right time and place. But he’s just woken up with a hell of a headache and no memory of the last twelve hours, only to find he’s violated his Non-disclosure Agreement – a crime punishable by death in the Four Posts. Now with a pair of incredibly brutal bounty hunters on his trail, Red has to clear his name and figure out what the strange prototype drug is doing to his mind before it literally tears him apart. VENTRELLA: What sort of research did you do before writing this? BROCKWAY: Too much. I’m kind of a link hoarder, and though the general framework of Rx is obviously science fiction, much of what appears in it was inspired by real stuff. The Four Posts were inspired by Ponte City, a huge single-skyscraper project in South Africa that, for a time, was considered the most dangerous place in the world. The drugs in Rx (well, excluding the Gas) are more stable, more potent versions of real pharmaceutical developments – drugs that eliminate fear, inspire trust, add IQ points. All real stuff. VENTRELLA: Why couldn’t you go with your original title? BROCKWAY: I’m assuming you’re referring to the original title of “Time Fuckers: Fuckers of Time.” Are the reasons not self-evident? I was never going with that title. It’s awful. I give myself terrible working titles until the book is finished to keep myself from taking it too seriously, and to stop from worrying about things when it’s not time to worry about them yet. VENTRELLA: You’ve actually done an annotated version of the book, with footnotes and asides and references listed. Why did you decide to do this? BROCKWAY: Well, it was all that research and link hoarding. I heavily fictionalized the info in Rx, so I wouldn’t blame anybody for not believing a word of it is remotely possible. But I wanted to show people that the real world has always been, is now, and is about to be much, much crazier than they would ever suspect. VENTRELLA: How did you publish this? 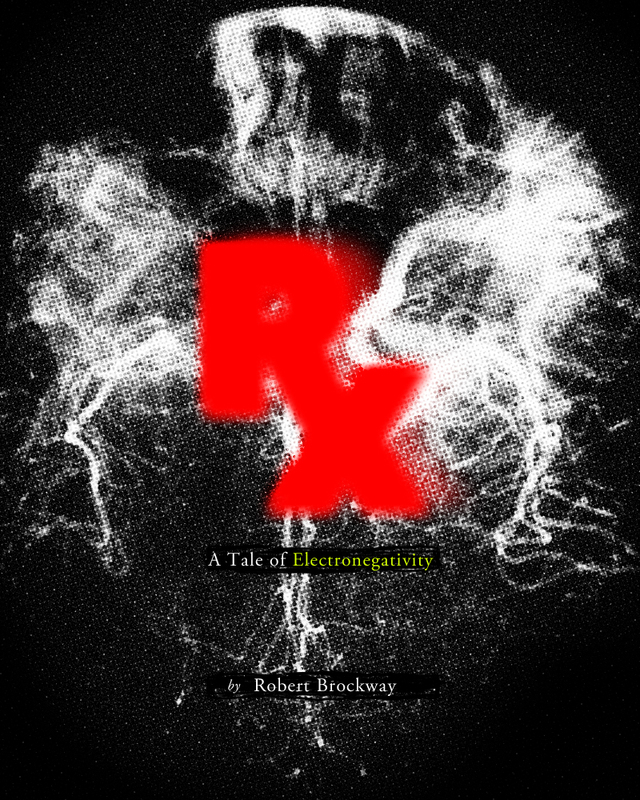 BROCKWAY: I published Rx as a serial eBook in three installments. I did this partly because I liked serial novels, partly because I was curious how it would do, and partly because I didn’t have a reliable network of Beta-readers. The plan was to self-publish these little episodes and incorporate reader feedback along the way. Then I would take a huge editorial pass on the collected version, and release that as a finished book. Toward that end, I ran free giveaways of the first episode, then included review incentives where any (positive or negative, so long as it’s helpful) review would earn you a free copy of the next episode. In that fashion, you could get the whole series for free, just by leaving reviews on each episode. VENTRELLA: What is your background and why did you decide to write? BROCKWAY: I’m not sure how to answer that: I decided to write because I’ve always been writing. I don’t know how not to do it. My background is happening right now, I’m pretty sure. I have in no way ‘made it’ or become some sort of name. I’m still practicing, learning from my myriad mistakes, and trying to get better. I hope I’ll always think of myself like that. VENTRELLA: Amazon is reporting that e-books are now outselling traditional publications. For beginning authors is this a good thing or a bad thing? BROCKWAY: I think it’s a great thing! I prefer physical books myself, though I’m definitely a hybrid reader these days. It’s most beneficial to beginning (I’d prefer the term ‘Indie’ as many aren’t really starting out, so much as just now getting seen) authors because, for the most part, your self-published books are just as viable as traditionally published works in these new marketplaces. I see indie books all the time, just browsing around on Amazon or Indiebound. I’m not even looking for them. But if your book hooks me with a good cover, killer title or compelling synopsis – you’ve just made a sale to a person who would otherwise never have even heard of your work. As much as we bemoan the death of book stores (and they shouldn’t die, I love them), we tend to overlook the upside: There’s one less middleman to filter out your work. 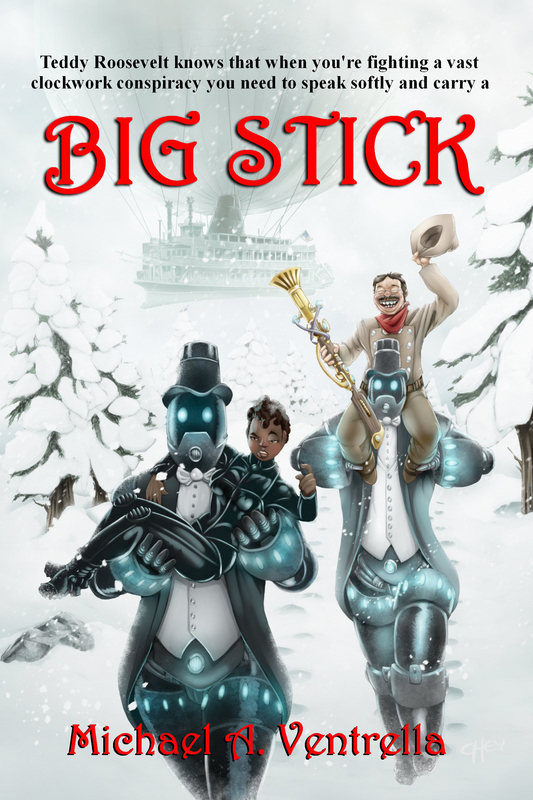 VENTRELLA: Hard science fiction seems to be taking a back seat to high fantasy, steampunk, urban fantasy, and other genres these days. Why do you think that is? BROCKWAY: I think it’s just because we’re segmenting our descriptions of the genre. We used to call all of that stuff ‘science fiction.’ Is my book ‘hard science fiction’? Some people have said so – derogatively, I might add – as though that limits its appeal. Others call it ‘cyberpunk’ – also derogatively (man, I’m sensing a pattern here). If we applied that pattern retroactively then 1984 would be ‘technological dystopian’ and FOUNDATION would be ‘dynastical space opera.’ It’s not: We’re all sci-fi. We’re all brothers and sisters in nerdishness here. BROCKWAY: Ambition. That’s my biggest mistake, anyway, and I don’t really feel comfortable pointing out the mistakes of authors who are likely far better than me right now. I don’t know if I fully pulled off Rx – it was a hell of a lot to try for as a debut novel. I further complicated matters with an experimental release schedule. I needed to write it, of course, to learn those lessons and improve as a writer — and I think a lot of readers still got some enjoyment out of it. But that will always be the sci-fi writer’s simultaneous curse and blessing: Ambition. BROCKWAY: Both. Natural talent happens in every field. Some people are naturally talented cabinet makers or heating repairmen. You can never fake that, but it doesn’t mean you’re excluded. I’ll never be as effortlessly good as, say, Italo Calvino. But if I work at it, I can still be pretty good someday. For example, Stephen King doesn’t think of himself as naturally talented. I’d actually agree with him. But he works at his craft, constantly, and in the end he’s going to be more influential than a hundred thousand other, naturally talented writers who phoned it in, thought they were above improvement, or never even tried. BROCKWAY: Anybody. Terrible answer, I know, but it’s all I’ve got these days: I’m finding so many more books thanks to recommendation algorithms or sites like Goodreads that my favorite authors are constantly shifting and evolving. Over the past few months, I’ve been most impressed with Patrick Rothfuss’ work, and I’ve got a working writer’s crush on Chuck Wendig. I don’t know how he’s so prolific while maintaining that kind of quality, but it’s something I respect and strive for. VENTRELLA: I’ve always enjoyed the articles you’ve written for Cracked with advice for authors. (Examples: here, here, and here) How have these been received? BROCKWAY: Mixed. People who don’t write don’t give a damn and feel compelled to tell me so in increasingly obscene ways. People who do write usually thank me. They do decent traffic with high engagement, to borrow some soulless marketing terminology. VENTRELLA: New authors can make huge mistakes. What big mistake bugs you the most, and how can writers avoid making it? BROCKWAY: They don’t edit. If you don’t obsessively, freakishly edit your story, then I promise you that you have made huge, gaping unforgivable mistakes, and everybody but you is going to notice and point and laugh. I edit everything. For example, I edited my responses to this interview. If I hadn’t, I wouldn’t have noticed that I used the word ‘obsessively’ three times in the span of two sentences. You would have laughed at me, and I would have had no choice but to kill myself to preserve my family’s honor. VENTRELLA: Do you attend science fiction conventions? BROCKWAY: I have attended one convention in my life. Comickaze, in Los Angeles, and I did so because I was ordered to by my employer. It was interesting and fun, but a bit awkward, and probably not representative of the larger scene. I’m kind of a hermit. BROCKWAY: I don’t know how to categorize it, really: It’s a novel with elements of mystery, science fiction, horror and magical realism. It’s about a group of punk rockers in New York in the late ‘70s, and a group of aspiring actresses in Los Angeles in the present day. Both are tied together through a mysterious set of disappearances, usually accompanied by a strange caustic sludge, and the impossible sighting of angels. It’s called “Punks Versus Math”. I told you I have terrible working titles.